The K-Series DRAG KIT II is designed for the Drag Racer who is not quite ready for the Dog Box but still likes to impress his friends on the street or the Drag Strip. 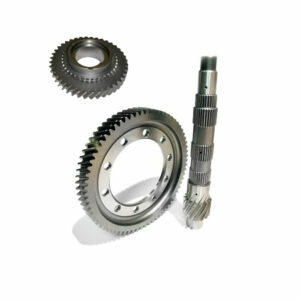 This kit comes with a Custom Main Shaft and the Taller 1st through 4th gears. Ratios: 1st – 2.313 2nd -1.650 Including NEW- stronger 3rd -1.304 & 4th – 1.080Rated up to 500HP. You can use the (oem) 5th.& 6th. 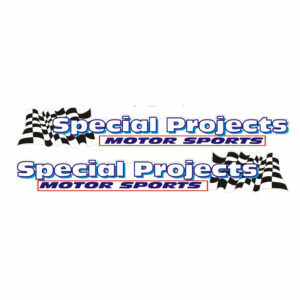 Or go a step further to our full Pro Spec. 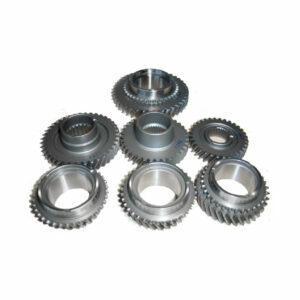 I 6 Speed Close Ratio Gear Kit. Fast Road /Track day 1st, 3rd, 4th, & 5th. Designed as a Drop in replacement Kit. 1st, 2nd. 3rd, 4th , 5th, 6th. applications are required, such as road and gravel rallying. a 5.06 or 5.08 Final Drive. 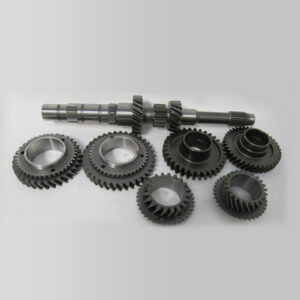 Kit consists of: A custom Main shaft, 4 custom Main Shaft Gears and Six Counter Shaft Gears. Pricing based on current international exchange rates. Includes International Shipping, Customs Duty &Fees. Pricing does not include Shipping within the USA. 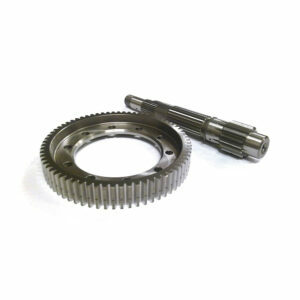 We can provide custom Gear/kits -Ratios to your specificatons. Call for pricing and Time frame. 1st. 3rd. 4th. & 5th. Once again we have put our years of racing experience to good use. Just as cool oil is the life blood of a high performance engine, so too is properly cooled gear oil to your racing transmission. During our extensive testing in our own team cars often recorded Gearbox temperatures in excess of 300º (F). In situations like that if you’re not running synthetic gear oil then your gearbox will soon be toast. Too often the incredibly high racing transmission temperatures go unnoticed and failing synchros, worn out sliders and gears are accepted as normal. It need not be that way; the racing life of your gear box can be extended indefinitely by installing a GEAR-X Transmission Oil Cooler System. 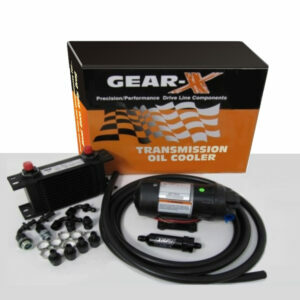 This kit comes with a very compact and efficient Transmission/Differential Oil Cooler Pump. These positive displacement-type pumps produce output directly proportional to motor speed. They are lightweight, self-priming pumps that may be mounted in any position up to several feet away from the source of oil. 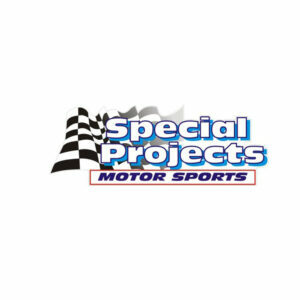 Also included is a highly efficient 11”x8” Oil Cooler and a XRP 10 micron inline filter, all the Dash-8 Puslok fittings, Electric On/Off Switch, 12ft of Pushlok high pressure hose and clamps are provided along with comprehensive instructions on fitting, wiring and plumbing the system to your Racecar. 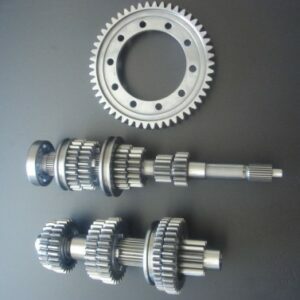 Perfect gearing for Turbo Applications. 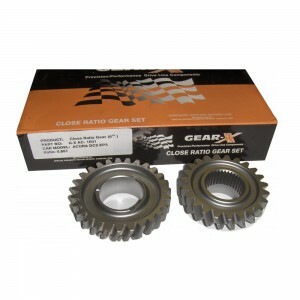 This final drive ratio works perfectly with Stock ratios or our GXHO-K CR1 or CR2 Close Ratio Gear Sets. 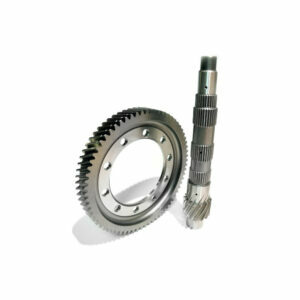 This Final drive is best suited for most Road Racing applications. 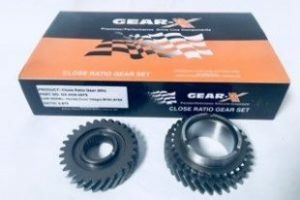 If using Stock Gear Ratios. 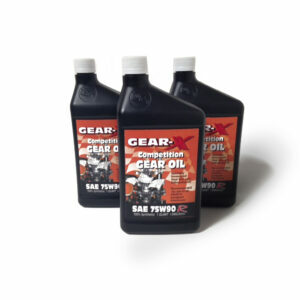 GEAR-X 75w90HD synthetic gear oil is designed to take 80% more load carrying capabilities than its competitors. GEAR-X 75w90HD is compounded with the most recently developed additive system to provide the ultimate in gear protection, from an E.P. wear, corrosive wear, and shock load wear standpoint. A friction modifier is also employed to reduce sliding friction resulting in lower energy requirements, thus less drag, lower fuel consumption, and more horsepower. GEAR-X synthetic gear oils offer both cold temperature advantages (Pour Point is -45°F) and high temperature stability (Flash Point is 480°F). 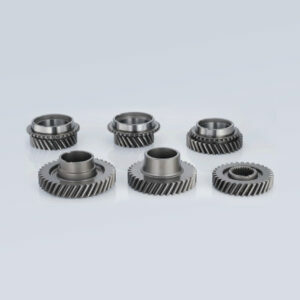 As a multigrade product meeting the low temperature viscosity requirements of a SAE 75 W grade gear oil, but also meeting the viscosity requirement of SAE 90 grade at operating temperatures. The base is a unique combination of synthetic components that permits meeting SAE 75w90 viscosity requirements without the need for a viscosity improver. GEAR-X 75w90HD gear oil spans a wide range of viscosity classifications making it the first truly dependable “All Seasons” gear oil. This means it will flow and properly lubricate at the lowest winter temperature while providing the film strength for heavy duty operations during boiling hot summer driving conditions. The advantages of such an oil have long been recognized as evidenced by the universal acceptance of multiviscosity motor oils. Withstand the extreme pressures and shearing forces encountered in normal gear operation. Consequently, the advantages of multi-grading are lost after only a few thousand miles of service. The new additive system used in GEAR-X 75w90RHD is almost totally resistant to these forces. GEAR-X 75w90RHD shows virtually no change in grade even after 50,000 miles of more of operation in heavily loaded, hypoid axle drives. This means that in addition to the fuel savings generated, GEAR-X will provide true year round performance in all climates from arctic cold to desert heat. Additionally, it will provide superior all around performance in virtually all applications calling for gear oil rated from GL-2 through GL-6, in any viscosity grade from 75w, 80w90, or 90w. 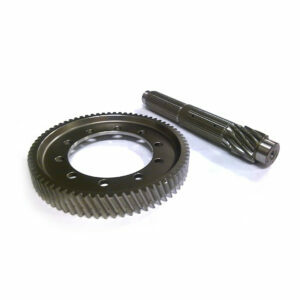 This can result in reduced gear oil inventories allowing a single lubricant to replace as many as 4 or 5 separate oils. 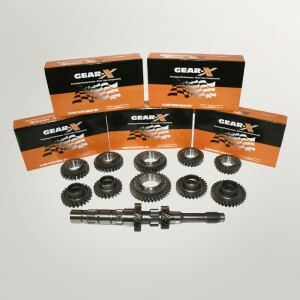 GEAR-X 75w90HD gear oil is recommended for automotive type gear service in manual transmissions, differentials, transfer cases, over-drive units, oil lubricated wheel bearing, oil lubricated universal joints, steering gear boxes, or any other gear unit calling for a high quality heavy duty 75w90 hypoid type gear oil. 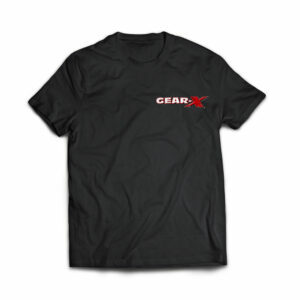 GEAR-X. 75w90HD is also recommended for use in all limited slip type differential designs. GEAR-X 75w90HD meets or exceeds performance requirements of Military Specification Mil-L-2105B, Mil-L2105-C, and API Specification GL-5, GL-6, and SAE Classification J306a. 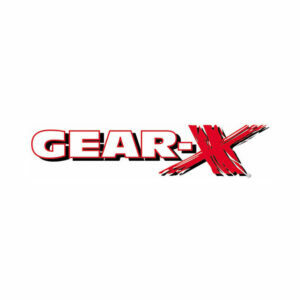 GEAR-X Synthetic Gear Lubricant has been race-proven in endurance competitions all over the world.